SANS has been selected to work in partnership with HM Government to develop and deliver the UK's first Cyber Retraining Academy. Cyber security is rapidly becoming a top global priority for governments and businesses. Despite the fact that the UK has a world-class cyber security sector, there is still currently a significant shortage of skilled cyber security professionals. "The Academy is like the Harvard Business School for cyber - you know the graduates are going in based on their aptitude, and will be going through the best training possible." In response to this growing challenge, HM Government, in partnership with SANS Institute, has created the Cyber Retraining Academy. An intensive and immersive ten-week training programme, the Academy aims to encourage and develop potential new cyber security professionals. The programme has been tailored to meet the specific cyber security needs of today's enterprises and government. The Cyber Retraining Academy is funded by the Government's National Cyber Security Programme which is helping develop the skills we need to the protect the UK online now and in the future. Successful applicants will be provided with free training for the duration of the 10-week programme, which takes place in London, beginning January 23rd 2017. 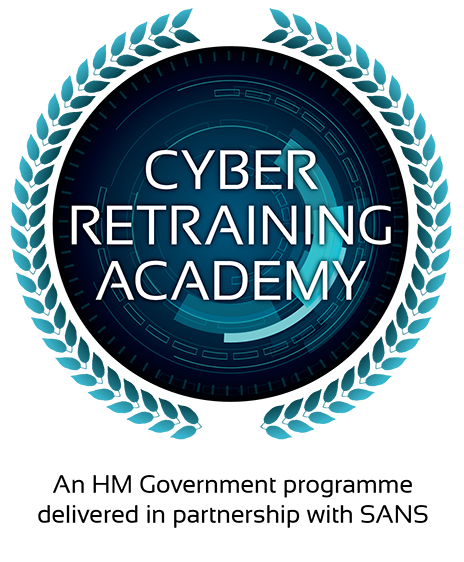 For full information and to apply to attend the Cyber Retraining Academy please visit our dedicated website here. The Cyber Retraining Academy has been created to assess, select, train and deploy new and much needed talent into the UK cyber security profession. Academy students are selected through a rigorous assessment process, using the SANS Cyber Aptitude assessment tool. The tool has been specifically developed by SANS, drawing on traits and characteristics of our world class instructors and cyber security professionals, in order to assess and identify those with the greatest chance of success in this field. Unique to the Cyber Retraining Academy recruitment process is the level of transparency offered to potential employers. Interested parties are encouraged to be involved as early on as possible and to discuss their specific requirements with SANS. On request, employers are also able to view the students' CVs and Aptitude results. All students are profiled online and tracked throughout the training programme and employers are therefore able to view and monitor individuals' performance and progress. All potential employers are also given the opportunity to attend careers fairs, which take place during the ten weeks of training, offering the chance to meet and interact with the students prior to their graduation. To register your interest in employing a Cyber Retraining Academy graduate and gain access to the online student tracker, please email retraining@sans.org. If you have any questions or would like more information about the Cyber Retraining Academy, please email retraining@sans.org. If you have any disability or condition that prohibits you from taking part in this application, please contact Steve Jones, Cyber Academy Manager on srjones@sans.org.